20lb Bag Covers 4,000 Sq. Ft.
50lb Bag Covers 10,000 Sq. 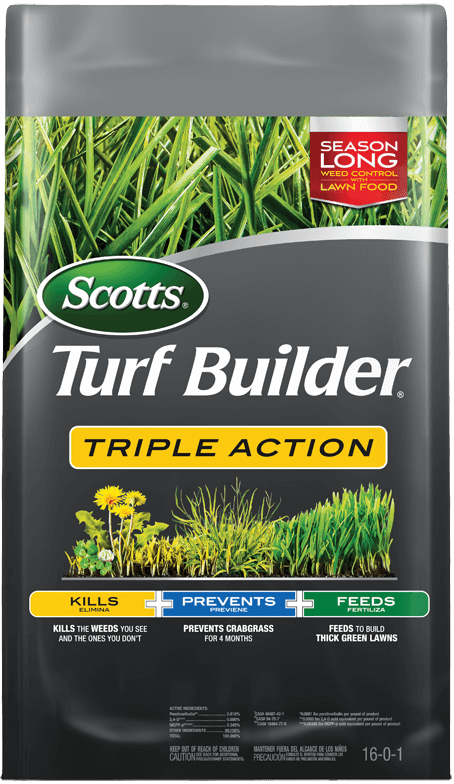 Ft.
Use on Bahiagrass, Bermudagrass, Centipedegrass, Fine Fescue, Kentucky Bluegrass, Perennial Ryegrass, Tall Fescue, and Zoyiagrass. Under certain conditions, temporary discoloration may occur on Bermudagrass, Bahiagrass, Centipedegrass and Zoysiagrass lawns. 1) Check the Weather: If rain is in the forecast in the next 24 hours, apply another day. Rain can wash the particles off weed leaves before it has a chance to work properly. 3) Apply to Wet Lawn: Make sure that the grass is wet from dew or sprinkling before applying (this helps the particles to adhere to weed leaves to produce best results). After 24 hours , water the lawn to wash the particles onto the soil to prevent the germination of crabgrass. 4) Clean Up: Sweep product from hard surfaces onto the lawn to keep valuable feeding nutrients on the grass and out of storm drains. Do not apply during winter dormancy period. Do not apply to newly seeded or sodded areas until after the 4th mowing. Do not seed, sod, rake or aerate for 4 months after application. Wait 5 months before applying the product on newly sprigged areas. Do not use on St.Augustinegrass, Floratam, Dichondra, Lippia, Carpetgrass, or Bentgrass lawns. Apply in spring when daytime temperatures are consistently between 60F and 80F and before the 3rd or 4th mowing. Do not apply to newly seeded or sodded areas until after the 4th mowing. Apply product when dandelions are actively growing. A fall application may be made to control fall-germinating winter weeds and cool season perennial weeds such as dandelion and clover. Do not apply this product more than twice per year. Allow at least a 4-month interval between applications of this product. To protect the environment, do not allow product to enter or run off into storm drains, gutters, sewers or drainage ditches. Scotts® No-Quibble Guarantee: If for any reason you, the consumer, are not satisfied after using this product, you are entitled to get your money back. Simply send us evidence of purchase and we will mail you a refund check promptly. Do not apply this product in a way that will contact any person either directly or through drift. Keep people and pets out of area during application. Sweep any product that lands on a driveway, sidewalk, or street back into the treated area. Do not apply directly to or new water, storm drains, gutters, sewers, or drainage ditches. Keep people and pets out of the area during application. Do not allow people or pets to enter the treated areas until dusts have settled. Apply to moist lawn, and then water lawn 24 hours after initial application. Apply to moist lawn. Then 24 hours after initial application, water in product to control weeds. After application expect control and/or prevention of listed weeds all season long. Kills the weeds you see and the ones you don’t. Stops crabgrass before it invades. Fertilizer feeds and strengthens your lawn. The Scotts® Wizz Spreader is the year-round spreader that you can use to feed, seed, weed, and melt during any anytime.